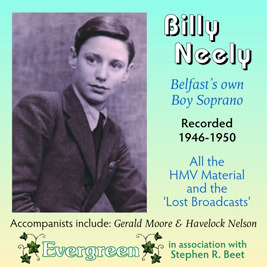 This new double-CD (for the price of one) of recordings by Billy Neely is an essential purchase for collectors of the unique (disappearing) voice of trained boy sopranos at their peak of fame. 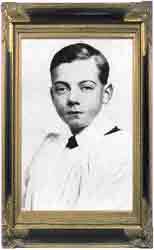 Billy (b.1935) developed from an eleven-year-old chorister to a famous fifteen-year-old professional singer, with numerous solo performances and broadcasts to his credit. His voice is pure and a natural musicianship from young age evident on many of the 42 tracks here assembled. His accompanists included the great Gerald Moore [R], and their HMV acetate discs have been "spectacularly processed and restored" for this release (a few of them had been included in The Better Land series, reviewed below - q.v. 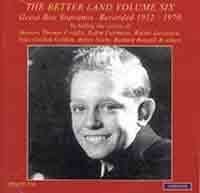 "The total clarity of Billy Neely’s account of Thackeray’s Tragic Story is a fine model for singers of today"). The presentation is impeccable. Tracklisting below and the complete booklet notes are on line at the link above. This disc, encompassing recordings from 1912 through to 1970, is the most recent of a substantial series, and a real testament to the beauty of the boy soprano voice. It also provides an interesting sidelight into the changing tastes during the period, and the prevailing trends in diction and pronunciation. 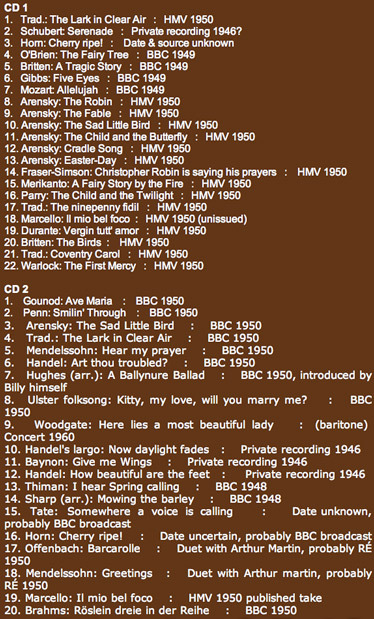 The “recital” begins and ends with 1940’s recordings of Thomas Criddle in what the late Alan Keith in his long running radio series Your Hundred Best Tunes would have described as “songs of yesteryear”. Criddle’s voice is outstanding, with great purity of tone and absolute precision with words and intonation. The two 1912 recordings by Walter Lawrence are also remarkable. With a voice of singular beauty he soars with ease to the highest of notes and has wonderful flexibility. There are a pair of splendid duets from John Evans-Pughe and Michael Lumb, whose voices blend most effectively, dating from 1939. In a varied selection, the music of Handel is well represented, and there are a couple of novelty pieces from the middle years of the century, both issued on record for the first time. The total clarity of Billy Needy’s account of Thackeray’s Tragic Story is a fine model for singers of today ! I must admit that it was the distinctive voice of New Zealander Richard Bonsall that really captured my heart, but all the 14 artists included on this CD are singers of real quality and every one is worthy of attention. The transfers are excellent and I look forward to catching up with the earlier volumes. There are six CDs in this series to date, the first released in 1999 featuring great boy sopranos 1914-1944, with as the lead song Heman-Cowen's The Better Land (with Doris Arnold’s The Kentucky Minstrels/Leslie Woodgate - names to conjure with for older readers...). Each volume includes gems and preserves superb singing from a vanished era. Stephen Beet has also produced a book of the same name which traces the biographies of many of the boys, including interviews with some that he had been able to trace many decades on - deep and rigorous research [there are six pages of Acknowledgements !] into a field of musical/social importance that could so easily have been lost. Of The Temple Church Boys, Ernest Lough's [illustrated] is of course the name best remembered, but Beet has ferreted out information on many individuals, such as "the legendary Joe Humm, who just 'pipped' Lough...". Of particular significance, and food for thought today, is Beet's analysis of changed training methods since early in the last century. Those born before 1930 find it now hard to convey to the younger generations the scene before the Second World War. Thousands of boys sang in hundreds of boys' choirs, with boy sopranos in great demand. In this unique, important and fully illustrated book, Stephen Beet deals sensitively with the emotional experience of the end of childhood, and the privilege and responsibility of unearthing memories from yesteryore of some whose early fame had not been achieved again later in adult life; all of them were however found willing to recount their stories to him a whole generation or more on. 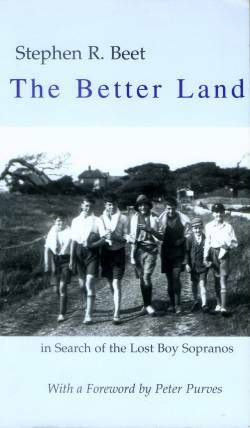 POST-SCRIPT belatedly received in 2009: On Saturday, 28th May 2005, at The Queen’s Chapel of the Savoy, Stephen Beet ‘launched’ his book “The Better Land” which is the story of some of the boys featured in the remarkable CDs reissued on the Amphion Label since 1999. - - We heard the still superb voice of Derek Barsham, now seventy-five years of age; he sang soprano until he was seventeen. Immediately the ‘bel canto’ quality was obvious. - - There was a touching moment when he joined with Dennis Wright, another of the famous boy sopranos, in the Boys Brigade hymn ‘Father, who hast made us brothers’. Harry Sever *from Winchester, a former Chorister of the Year, sang some solos pleasantly with a well-placed and focussed tone. Then a remarkable thing happened. 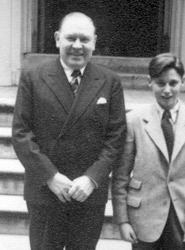 Master Sever joined Derek Barsham in Eric Coates’ ‘Star of God’ and immediately the younger voice itself took on the true ‘bel canto’ quality, imitating Mr Barsham’s accomplished technique. Quite clearly, Master Sever has had excellent training, but the dramatic change in his voice when singing with Mr Barsham was amazing. The book is a wonderful account of the careers of these fine singers and is subtitled ‘in Search of the Lost Boy Sopranos’. A whole generation of church musicians has grown up without any formal training in either singing or choral technique. Stephen Beet has, by his meticulous and painstaking research, revealed not only the ‘Lost Boy Sopranos’ but also the lost choral technique - and one that has nothing to do with vibrato!